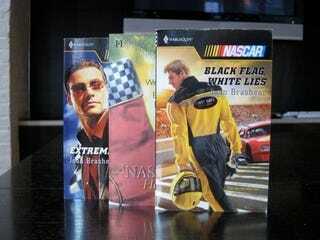 Want to win some Nascar harlequin romance novels? No, seriously. We'll randomly select a winner from the commenters on the "Nascar Novels" thread on our official Jalopnik Facebook fan page. Details below. As we attempt to build the next generation of auto enthusiasts, we've got to find a way to get the pro-Jalopnik message out to the not-yet-car-loving masses. What better way for you to help spread the message to your friends — as loyal soldiers in the Jalopnik army — than Facebook? All you have to do is head over and join our official Facebook page and drop a comment on the "Nascar Novels" thread there (not here!). Your comment serves as an entry into a random drawing for the books. You'll get three books in total, but one is a compilation of four Nascar Christmas stories! All you ever wanted for Christmas, huh? No? Oh well, whatever. It's free and we're trying to clean out the office. All you have to do is join and comment. FYI: we turned off comments on this post so as not to confuse folks who don't read instructions well. If you want to win you have to comment on the thread on Facebook, NOT HERE! That is all.